Home » Blog » Visual Art Exchange Exhibition! 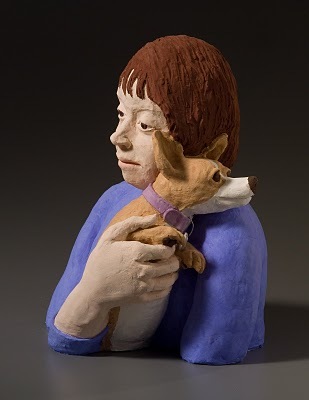 Just delivered 6 pieces from my People and Their Companion Animals series to the Visual Art Exchange in Raleigh, NC. They’re in the Exchange Gallery there, in the front, so can be seen from the street. Four other artists are in this show, which opens Friday, April 1, also a First Friday in Raleigh. So the town will be buzzing with people checking out the art and food scenes. The exhibit runs through the month of April. My art, influenced by an educational background in biology and anthropology, reflects my interest in the interdependence between humans and other creatures with which we share the planet. Inspiration comes from a desire to understand the world from a non-human point of view.This, along with many years of experience working with animals large and small, has enabled me to interpret nuances of behavior, subtle but evident if we take time to learn these languages. With patience and mutual trust, humans and animals can develop a bond where both parties communicate on an intuitive, or even spiritual, level. Although technology enables people (who have access) to exchange information frequently and instantly, there is still a fundamental human need for direct connection with another living creature. The companion animal lives in the present, accepts us at face value, finds joy in simple pleasures, and offers unconditional love. Sorry we missed you, Marina! We walked around a while then I had to be fed!